Nigeria’s first Vice President, Dr. Alex Ekwueme died on November 19, in London, the United Kingdom. Ekwueme was flown abroad with the support of the Federal government after he slumped in his home in Anambra State. 1.The former Vice President wedded his wife, Beatrice on December 19, 1959 and their union is blessed with children. 2. Ekwume hailed from Anambra and was born on October 21, 1932. 3. 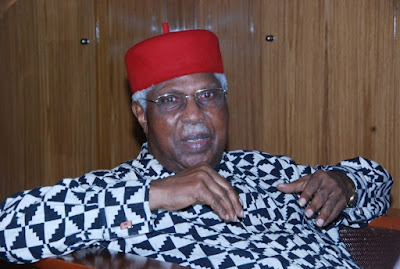 Ekwueme was the Ide of the Oko kingdom in Anambra State, where his younger brother, Lazarus, is the traditional ruler. 4. The late former Vice-President worked briefly with ESSO West Africa, Lagos, overseeing the Construction and Maintenance department. 5. He started primary school at the St John’s Anglican Central School, at Ekwulobia, then he proceeded to King’s College, Lagos. 6. He also attended the University of London; King’s College; Lagos, Nigerian Law School; University of Strathclyde and University of Washington. 7. He founded Ekwueme Associates, Architects and Town Planners, the first indigenous architectural firm in Nigeria. 8. Ekwueme was an architect who started his professional career as an Assistant Architect with a Seattle-based firm, Leo A. Daly and Associates, and also with the London-based firm Nickson and Partners. 9. Before he gained national and international limelight as the Vice President of Nigeria in 1979, he was actively involved in the socio-economic development of his community. 10. He was the leader of the Organisation of Africa Unity (OAU) observer team to the Tanzanian Presidential and Parliamentary election in 2000. 11 Ekwueme was also a member of the Economic Community of West African States (ECOWAS) Council of Elders.